When is the last time you’ve felt like there were enough hours in the day? Between spending the day at the office, rushing kids from one activity to another, trying to plan and cook meals and do the shopping, it can easily feel like there isn’t time in the day to breathe. As a member of today’s fast-paced society, what can you do to ease this constant strain of busyness on yourself? We’d like to suggest that meal prep is a fantastic first step to getting some of your lost time back and making your days a little less hectic. While this may seem like only one small step, you may be surprised just how much time it allows you to reclaim for yourself. Why Should You Try Meal Prep? At the thought of adding yet another step into our days, many of us may initially want to groan and say, “No, thanks.” If this is what you’re thinking, we get it. But meal prep isn’t just one more thing to add onto your already endless to-do list. Instead, think of it as a new step that combines several other elements from your list and streamlines them into a more straightforward and faster process, leaving you with more time when it counts the most. Why should you try meal prep? It’s simple, time-saving and convenient. Most importantly, it teaches you where to spend your time for the best results and where you’re wasting time. Never tried meal prepping before? Today is the perfect opportunity to start giving it a try. To help you get started, here are a few of our favorite easy meal prep tips. Try a few of these tips and experience the difference in your life. How many times have you gotten home to make dinner, only to find yourself staring into the fridge and pantry with no clear idea of what you want to make? Even once you decide, you’ll often realize you’re missing one or two crucial ingredients, necessitating a last-minute trip to the grocery store. Planning your meals at the beginning of the week cuts down on this lost time. Instead of wasting 10 minutes wandering the kitchen and trying to decide what recipe you have the ingredients for, you can get straight to work, already armed with a plan for that night’s dinner. Additionally, you’ll save time by only making one grocery shopping trip for the entire week, rather than rushing out every other night to grab a forgotten ingredient. As a bonus, your stress levels may also decline as you no longer need to waste brain-space with worrying about that night’s dinner. Part of the reason some of us struggle with deciding what to cook is that we don’t have a go-to book or folder of recipes. We may have one or two saved on our phone, another downloaded on our laptop and a few we’ve cut out of magazines, but none of these are easy to access at a moment’s notice. We recommend streamlining this system and having a method of storing all your recipes in the same place. This might be a physical book or a digital folder, but the important thing is that they’re all together and easy to access. One of the major beliefs of food prep is the practice of preparing certain food items ahead of time and storing them until you plan to eat them. For this plan to work, however, you’ll need a small army of reusable plastic or glass containers. If this isn’t something you already have, it’s time to head out to the store or pop open a shopping tab on your computer and buy a few. Make sure to grab some in each size, so that whether you’re storing an entire lasagna or a small container of hummus, there’s always an appropriately-sized container on hand. As you’re shopping, don’t forget to buy matching lids for every container. If you have the space for it, you may also want to sort out an organizational system to keep all the lids and containers separated and easy to match up with one another. While most of us have completely booked schedules during the week, the weekend is often a period when we find ourselves with a little extra downtime. If this is true in your case, use this extra time to lighten the load for yourself during the week. By preparing elements and ingredients ahead of time so that they’re ready to grab when you need them, you’ll be amazed by how much time you can save during the week. If you enjoy salads, you could join the thousands of people who enjoy mason jar salads, which can be easily prepped on Sunday and eaten throughout the week. If you find that you use something like rice or chicken in multiple meals throughout the week, cook these things over the weekend and bring them out to add to each meal as you make it. Try to brainstorm ways you could use your weekends to lighten the load on yourself during the busy weekdays. Multitasking is one of the best ways you can speed things up in the kitchen. It can be stressful at first, and you may even burn a dish or two as you get the hang of it, but before you know it, you’ll be starting to make a dent in the amount of time you spend in the kitchen. For example, do you need to wait while meat cooks? Use this time to chop ingredients. Waiting for veggies to roast? Use this time to empty the dishwasher. By using the same amount of time to accomplish multiple tasks, you’ll find that dinner is ready sooner and you’re less tired by the end of the evening. Just as multitasking is important when it comes to preparing the ingredients for your dishes, it is also a perfect way to save a little time when it comes to baking your different elements. It’s also a great way to cut down on your oven usage, as you’re consciously maximizing the time your oven spends running. For example, do you have a few chicken breasts that need to go into the oven? Pop your sweet potatoes in at the same time on a different rack. In cases like these, you may need to reconcile temperatures a bit and keep a close eye on your dishes. In this example, the chicken likely needs to cook at a higher temperature than the potatoes, so the potatoes will probably not need to cook for as long. You’ll want to be mindful of this and pull them out before they start looking overcooked. You may be making things harder on yourself by not taking advantage of some of the potential shortcuts available to you. As you plan your meals, take a look at the different ingredients and elements that will go into each one and ask yourself if there’s a way to make the preparation easier. Let’s say you need to throw some broccoli florets into a casserole. Have you been buying fresh broccoli, and chopping and steaming it yourself? Speed things up by grabbing a package of frozen chopped broccoli that you only need to pop in the microwave before it’s ready to eat. Or maybe you’re looking for some shredded chicken. Have you tried buying a small rotisserie chicken instead of cooking your own chicken? While these are only two examples, there are countless other shortcuts like these out there that you can take advantage of. All right, this tip isn’t technically a part of meal prep, but it will help you save time in the kitchen and will streamline your cooking process so much that once you begin doing it, you’ll wonder how you ever worked in the kitchen without it. This simple tip is to clean up after yourself as you go, instead of waiting until after dinner to clean up. All of us make a little bit of a mess when we’re in the kitchen, even if it’s just piling dirty dishes in the sink. The problem is that if you need to rinse veggies in the sink, or maybe strain a pot of boiling water, it becomes much harder to do so. You suddenly have to stop whatever you’re doing and unload the sink before you can continue, and even then you’ll now have to deal with those dishes sitting all over the counter. Don’t let these dishes pile up in the first place. If you use a dishwasher, load each dish once you’re finished with it so that they’re out of the way. And if you wash by hand, keep a sink filled with dishwater so that every time you finish a dish, you can take a short time to clean it and put it in your dish drainer. This way, the kitchen never gets cluttered enough to slow you down, and you don’t have to deal with a towering mound of dirty dishes after you’ve finished eating. Sometimes, the simplest way to speed up your meal prep is about being quick with your work. Practice your chopping skills until you can chop up anything in no time. While this seems like a laughably easy trick, you’ll be amazed how much time it can save. Having trouble with your knife skills? Look up some tutorials online to see how the experts do it. No matter how many of these tips you practice, there will always be some recipes that require more meal prep than others. Some recipes can easily be completed from start to finish in less than the time it takes to finish the prep work of other recipes. If your goal is to cut down on the amount of time you’re spending in the kitchen, it may simply be a matter of choosing the right recipes. You might commit to quick and easy recipes during the week, and then allow yourself a more elaborate meal on the weekends, when you have more time. To get you started, here are two quick and easy, simple meal prep recipes you can complete in minutes. 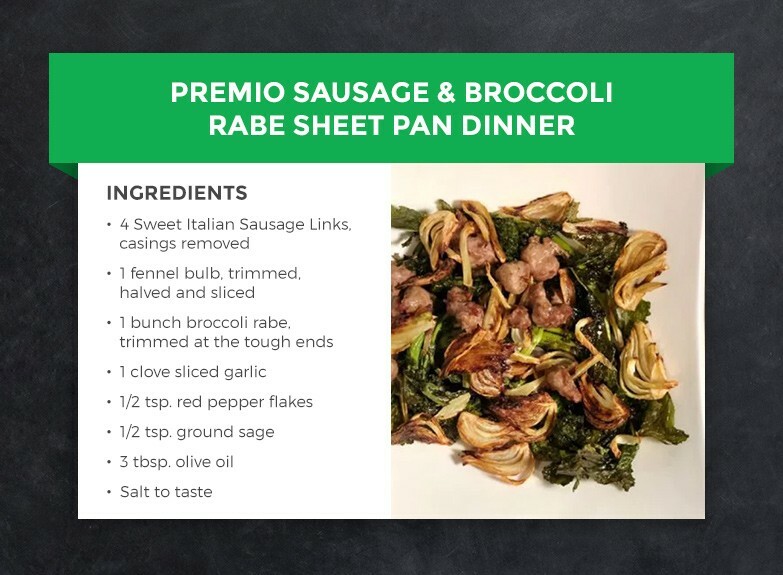 This Premio Sausage and Broccoli Rabe Sheet Pan Dinner isn’t just easy to prepare. It’s also healthy, delicious and beautifully simple. Set the oven to 425 degrees. While this is preheating, line a baking tray with parchment paper. Trim, halve and slice a fennel bulb before tossing it with a tablespoon of olive oil and salt. Place it on one end of the baking sheet and put it in the oven for 20 minutes. Once the 20 minutes are up, take four Sweet Italian sausage links, removed from their casings, and place them over the middle of the tray. Mix together a bunch of broccoli rabe, two tablespoons of olive oil, garlic, sage, red pepper and salt, and lay this out on the remaining side of the tray. Place the tray back in the oven and bake the entire thing for 15 minutes. Remove from the oven, toss the various ingredients together and enjoy this yummy meal for two. Don’t have a lot of time in the morning? These Premio Brunch Cups are great for making ahead of time so you can grab one and go on busy mornings. Preheat the oven to 375 degrees. While this is preheating, open a package of your favorite Premio sausage and cook it in a pan according to the instructions on the package. Once it’s cooked, chop it into half-inch pieces. Grab a muffin tin and paint the insides of the cups with melted butter to prevent sticking. Once you’ve coated every cup, unroll a package of crescent rolls and lay one sheet on a cutting board before brushing it with melted butter. Repeat this process by layering crescent sheets and melted butter until you have about 10 layers. Cut this layer of rolls into 12 squares of equal size and place one square in each of the cups of the muffin tin. Stir six eggs, three tablespoons of milk and some salt and pepper in a bowl. Place the cut sausage into the bottom of each crescent roll cup. Measure out a cup of shredded cheddar cheese and divide this among the cups over top of the sausage. Finally, pour the egg mixture into the cups, dividing it evenly among each cup. Place the muffin tin in the oven and let the cups bake for 15 minutes. Eat them right away, or save them and enjoy a pre-made breakfast every morning. It’s hard to cook delicious recipes like these and others without the key ingredient — Premio sausage. Use our handy store locator to find the Premio distributor nearest to you and stock your cupboards with your favorite flavors of Premio sausage.